Our ancestors and generations before their existence perfected and understood the moon phases and tides. They relied on them not for recreational reason, but to survive. There is evidence of this dating back to 2700 BC, the time of the ancient Sumerians who portrayed their beliefs via pictograms (One of the earliest forms of writing). I will try not to bore you too much with a history lesson, but I wanted to place emphasize on the importance of the Solunar, and the solar effects in relation to your catch ratio. Before modern civilization came about with our high tech gadgets, ancient man was able to see the increase in activity near full and new moons in “all wildlife”; fisherman who lived by the ocean, were able to see how the tides were dramatically affected around these crucial periods. The moons influence is obvious in many instances, the most obvious force being the gravitational and rotational pull that can clearly be observed with the tides. The rise/fall of the tide and the influence monitored by the moons relative position and angle AKA: apogee/perigee. Most evidence from modern experimentations indicates a vast increase in activity when the moon is directly overhead or directly underfoot (opposite of the earth). These periods are referred to as the “Major” and “Minor” periods. How this correlates to you in laymen’s terms, with the arrival of the new and full moon, comes the flood tides. These are periods in which the tides are highest and have most water movement. With more water flowing in the bays and estuaries, brings more opportunities for fish to feed. This triggers a response in fish to know that there will be “more” food readily available, therefore their feeding response is heightened. Ok, so now you want to know when the best time to fish might be? The best answer is “when you can” but if you want to have the greatest success, you must factor in the, moon, solunar, weather, and your fishing location. Optimal conditions to fish would be within the major period, on a high tide or the beginning of the outgoing at dawn or dusk. The other important part of the equation is location, learning where the fish travel as the tides move and how they stage up on the tide. Typically as the water rises, you move closer to shore (Right on the mangroves). As the water recedes you should move further from the shore and position yourself where there is water flow and possibly structure. Fish are opportunistic creatures, as long as they feel safe when an easy meal presents itself, you will usually hook up. So get out there and search for “fishy areas”. Use the above mentioned advice and watch your catch ratio thrive. Do you have any tips you would like to share, tips that have helped you land more fish? If so, please be sure to comment. Conditions are good with light northerly winds. Wind will shift to the northwest bringing cooler temps. Fishing is active. 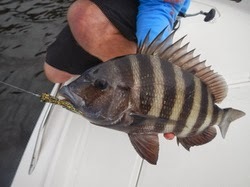 Many Sheepshead are taking live shrimp. Seems to be the season for Sheepshead, right now. Blues are biting on the outgoing tide as well as Snook and Reds. A few Flounder are being caught even though it is a little past their prime time. 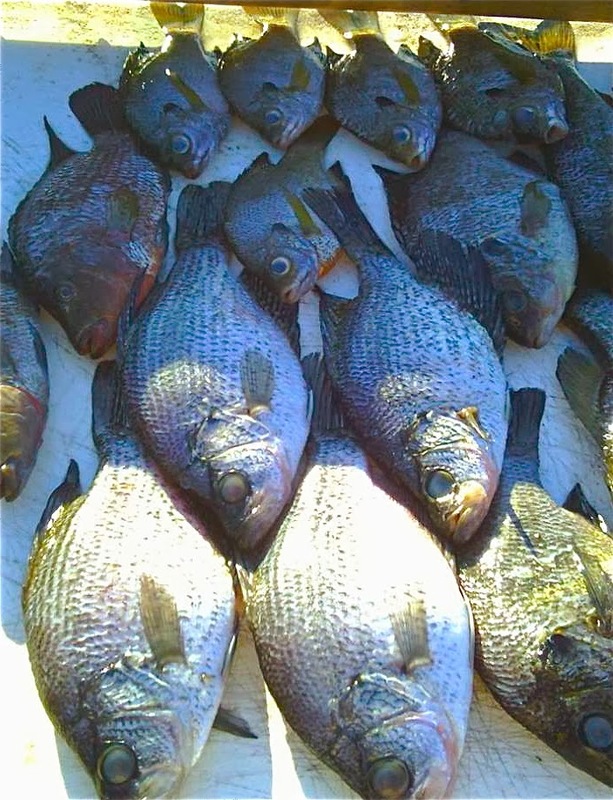 Photos show the results of targeting Sheepshead for dinner. There's always something going on at the Sebastian Inlet State Park. On Saturday March 1st, a Surf Fishing Workshop will be held at 1:00 p.m. at the Sebastian Fishing Museum on the south side of the inlet. The workshop is designed to introduce anglers to the basics of surf fishing. Inshore the trout fishing has been ok with a few fish around Bear point and J.C.. park with a few pompano mixed in. The snook fishing at night has been a little slow with this clear water live bait has been the bait of choice. Trout and Reds have been biting well around the power plant using C.A.L jigs and live shrimp. 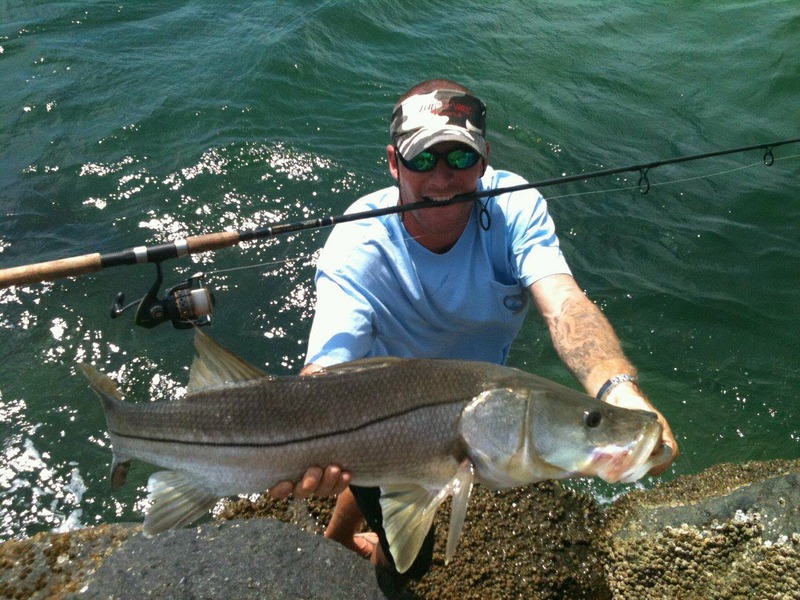 Snook are still biting well around the inlet and bridges using a variety of baits. Yesterday, the action was on the slow side on the north jetty. One good sized Black Drum was landed in the morning hours by Mike White of Sebastian, Chuck Fischer of Satellite Beach hooked up with a Snook about 4:00 a.m.; he was the only one on the jetty at the time and had to keep the Snook on the line while he retrieved his drop net. He managed to net the fish and pull it up, only to find that it was 35" and had to be released. A few decent sized Pompano came over the rails along with Sheepshead, Whiting, a few Blue Runners, Spanish Mackerel and Jacks. Our anglers in our photo today are (L) Sadekie McDonald of Orlando and Jermaine McPherson (R) who is visiting from Jamaica. Jermaine landed this nice, big Sheepshead using live shrimp. There's always something going on at the Sebastian Inlet State Park. This Friday, February 28th, is Movie Night at Coconut Point, on the south side of the Park. A family friendly movie will be played under the stars starting at 7:00 p.m. On Saturday March 1st, a Surf Fishing Workshop will be held at 1:00 p.m. at the Sebastian Fishing Museum on the south side of the inlet. The workshop is designed to introduce anglers to the basics of surf fishing. The overnight hiking trip was planned well in advance. We made lists of things to pack: The tent, blow-up pillows we bought for the trip, our National Geographic book on “Birds of North America,” another book on identifying mushrooms, plastic bags of dried fruits, and of course emergency supplies such as flashlights with extra batteries, waterproof matches and a wind-up radio in case our batteries ran out. We got up early the morning of our trip and made six sandwiches: Two PBJs, two bologna-and-cheese, and two turkey breast sandwiches on five-grain bread with alfalfa sprouts and soy mayo (my wife’s idea). I packed the over-the-shoulder cooler with food, drinks and ice, and off we went. It was early fall in New Hampshire, still a bit warm, and we climbed Mount Belmont and had one of the best hikes ever. It was gorgeous. About 5:00 p.m., we set up the tent, built our fire and settled down for some peaceful reflections and our turkey-ala-sprout sandwiches for dinner. Words cannot express the disappointment when I stuck my hand in and felt wet, soggy sandwiches. I extracted the now-unidentifiable vittles and we wanted to cry -- we were starved! Although we double-bagged the sandwiches, the water from the melted ice had seeped into our healthy sandwiches and ruined them. We made the best of it and ate a bunch of dried fruits and when we awoke, immediately ran for the nearest bush. On subsequent hikes, we used blue ice-packs rather than ice, but by the end of the day, they were warm and so was our food. They simply did not last from 6-to-6. We needed a solution to keep our food and drinks cold yet dry. Fortunately for me, I was speaking with a fellow angler named Marshil who had been using a product called NU-ICE for a few years on his fishing trips. I asked him what the deal was with NU-ICE. First, I asked him what size and type he used. It is a 5-lb. Marine Grade Ice Pack. Then I asked how well it worked. I asked how long he thought that setup would last. He said had the same thought and had tested it that first night. The NU-ICE pack that Marshil was using was from the Marine Series. These are designed to offer 96 hours of sub-zero cooling time with a single charge. All you need is a pre-frozen NU-ICE Marine pack, and a tightly packed cooler. You can also extend the charge of your NU-ICE pack by combining it with traditional cooling methods such as ice, but only with a leak-proof cooler. Robert Bowie, a partner in the NU-ICE company, explained the difference in the various types of products. The five-pound NU-ICE Marine Series keeps fish fresh for several days. The main difference is that to use the Marine Grade packs (2-or-5 pounds), they must be frozen at zero degrees Fahrenheit for 48 hours prior to use. This initiates the chemical reaction within the pack. The pack immediately begins to absorb energy (heat) and emit sub-zero temperatures once environmental temperatures begin to rise. On the other hand, the Ultimate Cooler Pack only needs to be kept in the freezer for 6-8 hours, and is made to keep things cold, not frozen. The company also makes a Medical Grade Pack, which has some distinct features that the other two do not have, and is used mostly for transporting pharmaceuticals, blood and tissue. Robert Bowie’s partner at NU-ICE, a Veterinarian named Dr. Cliff Glade, trains dogs for Armed Services MPs and for various Police Departments. A few years back, a couple of his Police Officer dogs became ill and Dr. Glade ordered medication that had to be shipped quite a distance. By the time life-saving medicine arrived, it had turned bad due to insufficient cooling. Dr. Glade, along with his nephew who had a background in chemistry, decided to invent an ice-pack for the 21st Century. After some trial-and-error, they manufactured the Medical Grade Pack of the NU-ICE line and began selling it through Dr. Glade’s contacts in the police and Armed Services. It was also immediately brought into use by hospitals for shipping sensitive medicine. (NU-ICE works with the client through all stages of the shipping process to ensure that the precious and life-saving cargo gets where it needs to be at the temperatures required). Refrigerated or frozen transport of crucial medical supplies was the beginning of NU-ICE. After a few years of exclusively marketing the Medical Grade Packs, NU-ICE developed variations of its revolutionary product for recreational use by the general public. They introduced the Marine Grade Series and the Ultimate Cooler Series at the Ft. Lauderdale Boat Show in 2011 and according to Bowie, the response was overwhelming. After further research and invention, NU-ICE announced in 2012 the availability of the recreational freezer and refrigerator packs. The Yeti Cooler complete with aluminum trays, cutting board and three Ultimate Packs. NU-ICE is a reusable product that allows boaters and anglers to save money on ice and at the same time maintain sub-zero temps for extended periods. Marshil just bought another 5-lb. Marine Pack and is thrilled about its ease-of-use and the money it saves him. In Jensen Beach, Captain Rufus Wakeman, who runs Hot Tuna Charters, and his fellow professional sailfish Captains spend their days in Stuart, Fla., catching huge sailfish and using ballyhoo as bait. He said the Captains who pursue sailfish put a lot of effort into the job, and can’t afford to lose their bait due to a poor setup in their bait coolers. It's another lovely morning at the Sebastian Inlet. Winds are barely moving out of the Northeast, but we will see it pick up to about 5 mph later this morning. The water is clean with a light chop on the surface. We received an update from inlet regular Mike Ricciardi yesterday who fished the north beach yesterday morning. Mike was expecting Pompano, but didn't have any luck with them. He left the beach with 8 Whiting, not a bad haul! Mike also reported that Chuck Fischer of Satellite Beach and Tony Swiderski of Sebastian both landed decent sized Black Drum from the north jetty yesterday morning, and Pompano were hitting off the jetty! There were also a couple of Snook hook ups, but no slot fish came over the rails. Our first photo today features Bill Hillman of Kissimmee with a beautiful 31.5" slot Snook he landed was 13 lb. using live shrimp. Photo two features Matt Heritage of Port St. Lucie who landed his Sheepshead using live shrimp. Vero Beach resident and frequent jetty angler Steve Bozzuto is featured in our third photo. Steve landed his two nice Sheepshead using live shrimp. Okeechobee lately as well, if you have never fished out there and looking to go check outwww.crippenfishing.com for charter rates and info. Inshore yesterday the fishing was steady with some nice reds around the Jensen causeway with a few trout mixed in, There were also reports of some pompano around the sailfish flats.The snook fishing has been steady in the inlet on live bait and on jigs. We have a few clouds over the inlet this morning, but it is a real pretty day. Winds are blowing out of the West at 5 mph; gusting to 7 and the water is clean and calm. 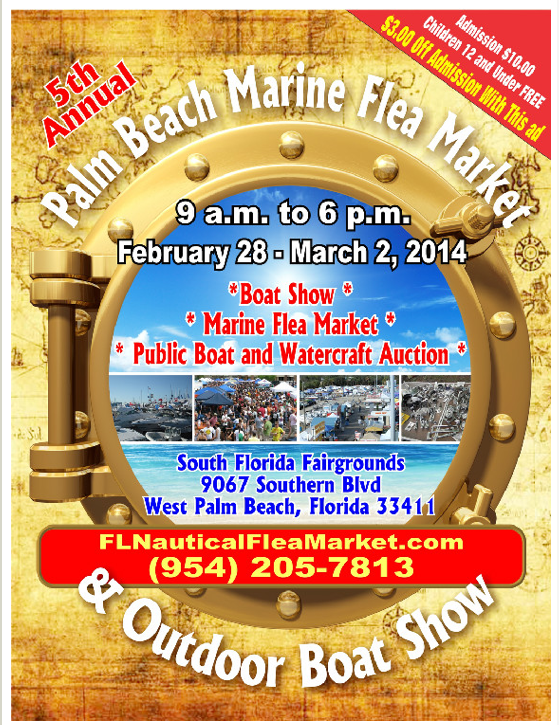 Tommy Turowski of the Sebastian Inlet Bait and Tackle Shop reported an active weekend. A lot of good sized Sheepshead came over the rails along with Snook, Blues and Sea Trout. A few Black Drum, Spanish Mackerel and small Flounder were landed as well. The T-Dock and north beach were producing Pompano. Our first photo today is courtesy of Sally Baughman of Jackson Hole, WY. Sally took the photo of Brayden Hoffman of Lakeville, PA with a Pompano he landed off the T-Dock. Vern was doing very well with the Sheepshead using live shrimp. Vern is featured with two of his catches. Well the weather has been perfect, lots of sun, moderate temps a little wind and lets just say perfect. This is the time of the year when you find out why it is called fishing and not catching. Depends on who you talk to and where they were fishing. Surf anglers what can I say, think about the time of day and the tide that you had a great day at the beach. 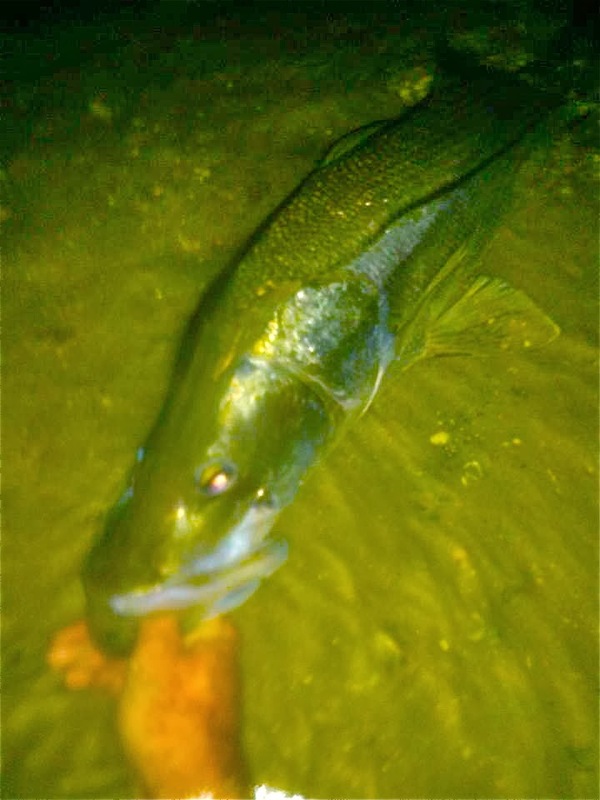 Cooler temps for the Blues and that means early morning, cut bait preferred. Pompano love the most environment, high tide, do not care what time, two hour before through two hour after, sand fleas and clams preferred. Now for the best table fare. Lots of Whiting, and they are there all day, just fish up close. Shrimp, clams, fish bites, it’s easy to feed this group. Looking just to bend a rod the surf is the place, something going all day with bait or lures, do not forget the sun block. Snook fishing has picked up with the warmer water temperatures in the river. Live baiting in the St. Lucie river has produced fish in good numbers. Docks from the 10 cent bridge to the Roosevelt held fish for both morning and night anglers. 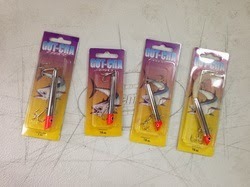 Hard plastic plugs like the Yo-Zuri Crystal minnow work as well. Fishing from the Jensen Causeway has produced a mixed bag of Mackerel, Drum, Sheepshead, Snook, and a few Pompano from the East side relief bridge. Up to the North around Bear point, Trout, Ladyfish, Jacks and even heard of a school of Redfish or two. Inshore fishing has been good as well, with alot of slot size Snook being caught in the inlet and around the bridges. 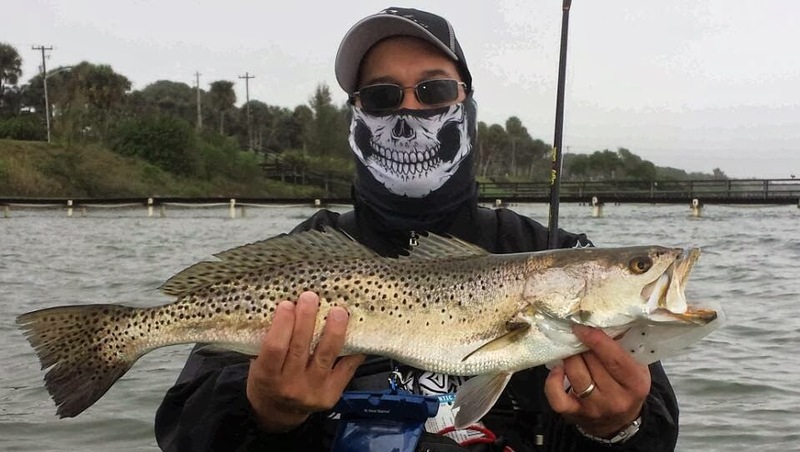 Redfish and Trout have been cooperating for many anglers as well down South around the power plant and a decent bite around Round Island and North. Inshore the pompano are around the sailfish flats little pink and yellow jigs have been the hot color.Back to the north around the power plant has been good with some nice trout and reds on the west side of the river on live shrimp and soft baits. The snook fishing was steady around the bridges and in the inlet with live bait. The best bite around the areas that we have fished this week continue to be black drum, sheepshead and redfish. There are plenty of other species out there to keep your rods bending as well. Ladyfish, jacks, snapper are just a few of the species that are all over the river and lots of fun for the little ones. We have caught a few nice trout and now that the water is warming up, you can expect that bite to improve each day. 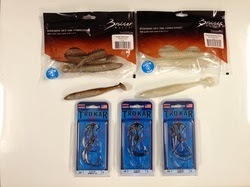 CAL jerk baits work great on the sea trout. Docks have been very productive for us on a variety of fish. Our redfish are coming from the docks and mangroves. Most are juveniles, but fun to catch. DOA shrimp or CAL paddle tails are super redfish lures. Redfish should be plentiful this year! Whiting has been plentiful along the beaches with some pompano, bluefish and jacks mixed in the catch. The inlet and jetties have held Spanish mackerel, jacks, bluefish, snapper and sheepshead for anglers fishing those areas. I've had a number of kids this week and the ladyfish and jacks have provided some fun action for everyone. The action has been good all over the river this week and will only get better in March! Have some fun and get out fishing! We have another stunning morning at the Sebastian Inlet. Winds have picked up a little, blowing out of the South at 10 mph and gusting to 14. There is a moderate chop on the water, but no NOAA warnings at this time. Always check the NOAA forecast prior to going offshore. We have a good chance of rain late this afternoon and Saturday and possibly on Sunday, so go prepared if you head to the inlet. We've had a bit of a slow week, but we've still seen some nice fish off and on. A few good sized Sea Trout, Black Drum, Sheepshead and smaller Spanish Mackerel have come over the rails of the north jetty. Tommy Turowski of the Sebastian Inlet Bait and Tackle Shop reported that yesterday afternoon Bonito, Blues and Mackerel moved in hitting silver spoons. Our first photo today features Angela Wigfall of Orlando. While everyone else was hanging around catching nothing, Angela and her husband Kirk took advantage of a steady Sheepshead bite around 9:00 a.m.! The couple was fishing off the north jetty using live shrimp and landed four good sized Sheepshead, the one in the photo was the largest at 15" and 3.5 lbs. Our second photo features James Stafford of Jackson Hole, WY with his first Snook catch, ever! James landed his 31" slot Snook off the north jetty at night using live pin fish. Talk about beginners luck. We have a beautiful morning at the inlet. Winds are blowing out of the East-Northeast at 1 mph and there is a very light chop on the water. We have the same cast of characters make appearances at the inlet although not in huge numbers, enough to keep most of our anglers happy. Nice catches in a variety of species including Black Drum, Sheepshead, Sea Trout, Blues, Whiting, Spanish Mackerel, a few Snook and Reds have been coming over the rails and Pompano have been landed off the beaches. The Black Drum have been taking live and dead shrimp and clams, Speckled Sea Trout have been taking live shrimp and small pinfish but they are also fans of artificials such as swimming or topwater plugs, poppers and streamers. We've seen most of the Trout activity on the flats or in the inlet off the rocks. 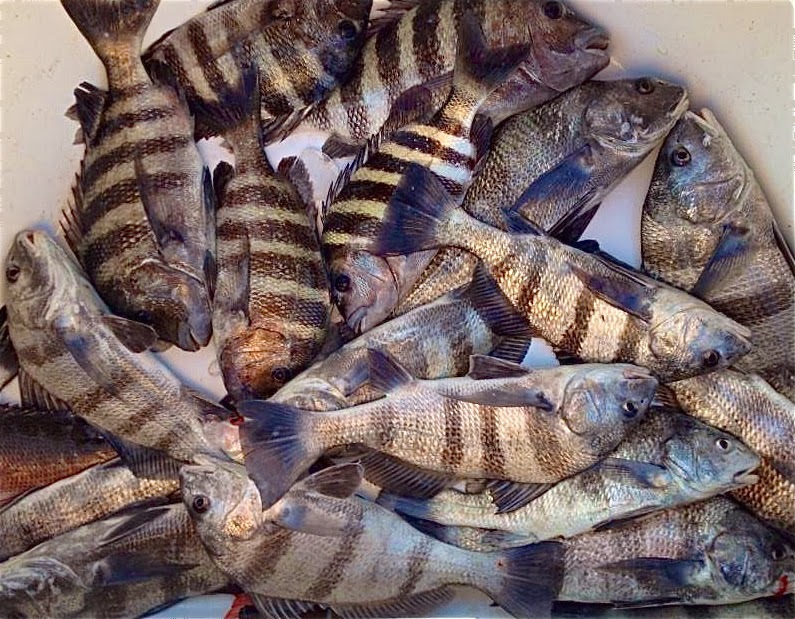 Sheepshead are crustacean lovers, making their meat some of the sweetest out there. Shrimp, crabs, sand fleas and clams all work for that species. 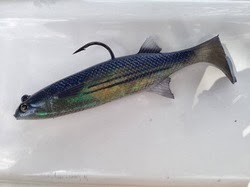 Spanish Mackerel will go for gotcha lures, silver spoons, small white nylon jigs and will go for small baitfish with a lot of silver color and on occasion, live shrimp. Get out and try your hand at fishing and enjoy the gorgeous day! Our angler of the day is inlet regular Tony Swiderski of Sebastian. Tony landed this good sized Black Drum last week using live shrimp. Inshore yesterday the fishing was steady with some nice trout from Bear point to the power plant with soft baits and live shrimp. There were also a few reports of some redfish to the north of north bridge with some trout mixed in. The pompano fishing has been ok around J.C. park on the incoming tide. What a beautiful morning at the inlet! Winds are blowing out of the North-Northeast at 4 mph and the water is clean and calm. We have a perfect, light ripple on the surface. It would be a great day to get out and fish if you get the opportunity. Unfortunately, many of us are stuck inside working, but for those of you who aren't, go for it!! With the beautiful weather, the jetties become more crowded. Please look at fishing etiquette at the top right of this page. If you are on the jetty early in the morning using multiple rods and there's nobody there, it's fine to spread out. As the jetties become more crowded during the day, pull your fishing rods in so that you are manning them and they are within your reach. Taking up all the "good spots" on the jetties is inconsiderate, and we all want to be known as good sports that use proper fishing etiquette. The bite picked up last week, but some species remain elusive, like the big doormat Flounder. We've had some nice Black Drum catches, good sized Sheepshead, some beautiful Spotted Sea Trout which are plentiful on the flats, Blues and smaller Spanish Mackerel coming over the rails of the jetties. Whiting and Pompano are being landed from the beaches. An occasional Snook or Red will make an appearance as well. 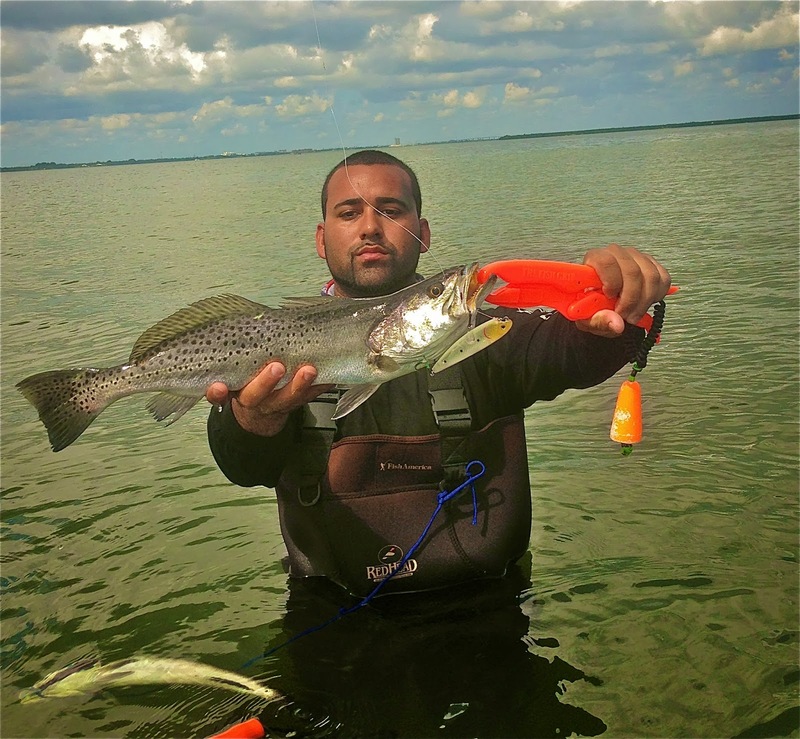 Our angler of the day is Luke Vila of Kissimmee. Luke, his brother James and friend Justin Mitchell fished using live shrimp, landed the good sized Bonnethead Shark . OUR WEB CAM IS DOWN. WE ARE INVESTIGATING THE CAUSE AND HOPEFULLY WE WILL HAVE IT UP AND RUNNING SOON. We have another gorgeous day at the inlet. Winds are blowing out of the North-Northwest at 5 mph and there is a light chop on the water. The water has been very clean. We have several updates for you today from various readers. Victor Gonzalez was at the inlet last week and landed enough Blues for a decent meal but reported some issues going on at the north jetty. Victor witnessed an angler who landed a catch and release Red and when challenged he kicked it off the pier instead of releasing the fish head first. That type of behavior cannot and should not be tolerated. We have precious resources that must be protected. If you see somebody who is in violation, don't hesitate to report them to the FWC. FWC can be contacted at 1-888-404-3922 or from your cell phone call *FWC or #FWC, depending on your cell provider. Victor also reported anglers setting up poles and leaving them to fish another area. Anglers should always be physically present at the terminus of the fishing gear, according to Florida Administrative Code 68B-4.0086. Rich Blum of Vero Beach fished Friday morning and reported a chilly 48 degrees and a slow bite until the tide change around 10:30. For about one hour the Black Drum bite turned on and 9 nice Drum came over the rails. Rich landed a 24" and a 20", but he left when the bite slowed. Tommy Turowski at the Sebastian Inlet Bait and Tackle Shop reported Sunday afternoon the Bonito, Blues and Spanish Mackerel turned on for those using lures. A lot of Sheepshead came over the rails this past weekend. The Black Drum back was fair but a 17 lb. Black Drum was landed along with a 9 lb. Sea Trout! 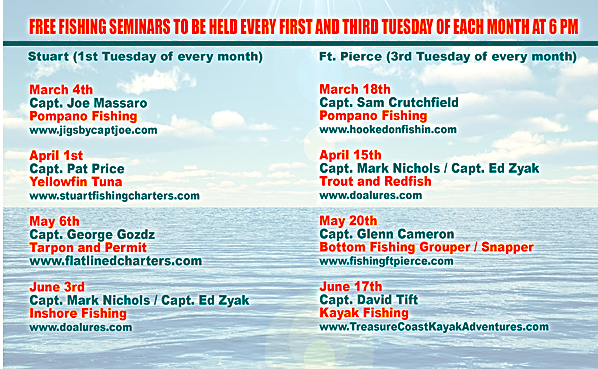 February has turned out to be a super month for mild weather and outstanding fishing action around the Treasure Coast. The cold fronts have become weaker as the month progresses and the sun has been shining most days for us on the water. As we continue to transition into spring conditions, expect the usual cool fronts each week and lots of sunshine ahead for anglers. The winds will continue, but we usually get one or two days each week that will be milder. Remember that you must fish your bait or lures very slowly. Water temperatures are cooler and the fish will be lethargic most of the time. Working your lures slower will give them more of an opportunity to take the bait. It's been a fantastic month so far! We have had lots of action around the river lately. A good variety of species to keep anglers excited. Sheepshead and black drum have been a staple for us this month, but we have had very good success with the redfish bite. We continue to find redfish around the docks and mangroves of the river. DOA shrimp or live bait will help you find some nice action. Our trout bite improves each day as the sun warms up the water. CAL jerk baits have been working great on the grass flats. Round Island, Queen's Cove and Bear Point have all been productive on the trout. 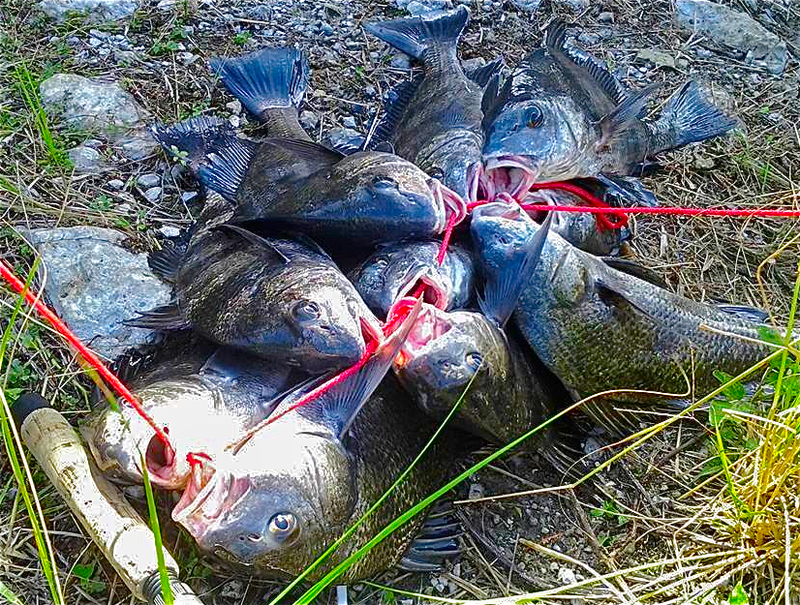 Sheepshead and black drum are plentiful around the docks, channel edges and bridges of the river. They provide plenty of action and are quite tasty for the table as well. Whiting and croakers are the main catch on the beaches. They are finding some pompano and bluefish in the surf, too. It's been a busy week and anglers have enjoyed some great fishing action. Have fun out there...Spring is just around the corner!